The two suspects in the murder of businesswoman Monica Kimani are set to make applications to be released on bail on Wednesday after spending almost a month in remand. TV journalist Jacque Maribe and her fiancé Joseph Irungu have since denied the murder charge levelled against them. 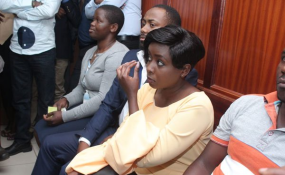 In an affidavit seen by Nation, Ms Maribe has pleaded with the court to free her, claiming she is not a flight risk and has fully cooperated with the police. Ms Maribe has insisted that she was neither involved in the murder of Ms Kimani nor present during the occurrence of the crime. The court will on Wednesday hear the couple's application but the prosecution has opposed the release of the suspects, saying investigations are still ongoing. The prosecution said it is probing the case and is seeking clues in South Sudan, where Ms Kimani ran a family business. Ms Maribe has also pleaded with the court to consider her four-year-old son who is suffering from her absence and issue her bail. Her application will be heard together with Mr Irungu's, who the prosecution says was at the scene of the crime. Ms Kimani was killed at her apartment on the night of September 19 several hours after arriving in Nairobi from Juba. She was scheduled to travel to Dubai for vacation before her plans were cut short in the hands of ruthless killers who slit her throat. The television journalist has been held in remand since September 29 while her fiancé has been in custody since September 24.